The German Bundestag supported, by a large majority, Chancellor Angela Merkel hours before the crucial meeting of EU leaders and the eurozone in particular. The lawmakers gave Ms Merkel a clear mandate to negotiate with the other 16 eurozone countries to find a comprehensive solution to the debt crisis. The main elements of this comprehensive solution are the new rescue programme for Greece, private sector involvement in the Greek debt reduction and increasing the eurozone rescue fund EFSF, the official press release of the chancellery stated. The Economic and Monetary Union is currently experiencing its biggest stress test, Angela Merkel said in her speech to the lawmakers. "We want to Greece quickly get back on its feet," she said, as this would require "a larger share of private creditors on a second rescue package for Greece." 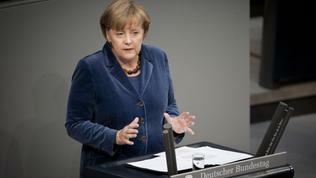 Athens must reduce its debt to 120% of its economy by 2020, Ms Merkel noted. According to Eurostat's provisional data for 2010, the Greek debt is about 150% of GDP. To achieve such a reduction, instead of 21% losses agreed on July 21, Greece's private creditors should suffer significantly greater losses. According to the Troika (the European Commission, the ECB and the IMF), these should be around 50%, according to the eurozone governments - about 60%, and banks offer no more than 40%. Negotiations on this issue are still ongoing and it seems unlikely to end with a concrete solution today. As euinside already forecast, it is not expected either a detailed decision to be taken on the other issue - the increase of the rescue fund EFSF. 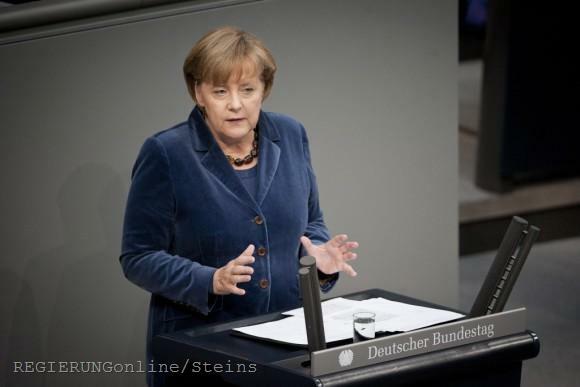 Angela Merkel told the lawmakers that at the summit a political decision on the matter would be taken and then appropriate guidelines would be presented for the model to increase the fund's efficiency, which would be again consulted with the Bundestag. In any case, any involvement of the European Central Bank is excluded: "All models in this direction are off the table," Chancellor Merkel underlined. She said the risk of the fund's maximisation would be acceptable and German participation in it would remain unchanged - 211 billion euros. According to the official release of the chancellery, two models are being discussed, as euinside already explained. One is the EFSF to insure partially new debt issuance of eurozone countries that are under market pressure. The second option is to set up a special purpose vehicle (SPV) through which to share risk between public and private funding, adding to the public funds of the EFSF external financing from private investors. According to the chancellery, the two models are not mutually exclusive from each other. A possible combination between the two options was mentioned also by European Council President Herman Van Rompuy after the meeting of eurozone leaders on 23 October. analyses An Italian Remake of the Series "The Economy or Democracy, Voter"